This post is just for moms (sorry dads). I’m working on a new project just for you. How would you feel about a weekend for you (no kids) and a small group of other moms to come together for some rejuvenation and to breathe some fresh air into your most important job- being a mom? I am looking for a location in Maryland to do just this.Think about the last big project you undertook. Maybe it was moving into a new place, or an assignment from work. Think about how much time you dedicated to the planning of the project. Think of the time you took to map out what your intention was with the project. When was the last time you sat down and really took some time to think about what you want for your life, and who you want to be in relationship to your children? A mom’s weekend retreat would give you time and motivation to focus on just such an idea. If a weekend like this sounds interesting to you, please take a moment to answer a quick survey. I am in the process of making it happen and want to give you something you will truly enjoy. Thank you for any help you are willing to give. Feel free to use the comments section below to make suggestions if you are not up for taking the survey. In my work life, next to being in the office with families, and writing, I love, love, love teaching others how to feel better, love better, and live happier lives. I am always looking for new opportunities to present and share my knowledge with other and I am so excited to share a couple of upcoming opportunities I have been given to do just that. Synopsis: While many social workers are celebrating the result of the recent popular vote in Maryland to enact the Civil Marriage Protection Act, what does the law mean in everyday terms for LGBT couples and their children in light of the federal Defense of Marriage Act and other state, federal and international limitations? In this panel discussion including a clinical social worker, an attorney and an advocate who work with the LGBT community, learn a brief history of the work that went into passing the measure, the legal implications of the law (what it does and does not protect for families), issues you may see in a clinical setting, and the next steps for full equality for the LGBT community in terms of marriage and beyond. Participants will have ample opportunity to participate in a question and answer session following the panel. We know from research that attachment styles form the foundation for the ways people look at the world and that a healthy attachment style is essential in forming a happy, healthy adult. 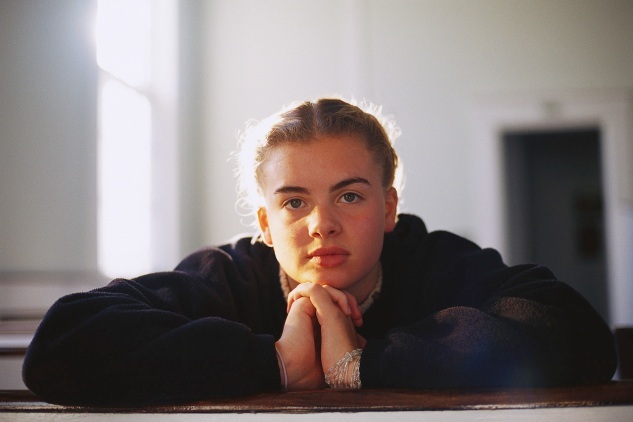 We know too as clinicians that many of the children and adolescents who come through our doors have not formed a healthy attachment style due to trauma, parental addiction or mental health issues. John Bowlby and Mary Ainsworth laid the foundation of the research which describes healthy versus unhealthy attachment styles, but what is a clinician to do when a child comes to you with a pre-formed, unhealthy attachment style? Therapists such as Dan Hughes and Art Becker-Weidman have more recently built upon the early research to teach clinicians how to address attachment related issues in treatment in a way that understands the root causes of attachment disturbance and treats these issues from the root causes. 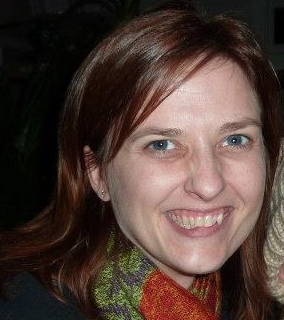 In this workshop, Kate Oliver, LCSW-C will train child and family therapists and adoption and foster care workers about the basics of attachment, how to spot attachment related issues in children, and she will provide a framework for working with children and foster or adoptive parents in therapy to repair a disrupted attachment style. Based on her years of experience working with traumatized and attachment disturbed children, Ms. Oliver will provide clinicians with techniques to engage parents and children in re-patterning attachment styles using lecture, videos and role plays. 1. Sometimes you read something that just sticks with you and you want to keep referring back to. Kristen Barton Cuthriell over at Let Life in Practices wrote just such a post. It is called How to Become a Happier Person. I think we all need to read it. To get to it, you can click here. 2. In the spirit of the holiday’s Leah DeCesare over at Mother’s Circle invited me to do a guest post about a family tradition we have for this time of year. I would love to invite you to check it out now by clicking here. 3. Lastly, Karen, over at Familosity, was kind enough to mention me in a post she made about finding our true mission. I wanted to send her my appreciation for recognizing that I am working to live my life’s mission and to share her lovely post with you all. You can find the post by clicking here. For my local readers, I wanted to share the announcement that I will be starting a new drop-in group for parents. Please feel free to pass on this information to anyone you feel would benefit. 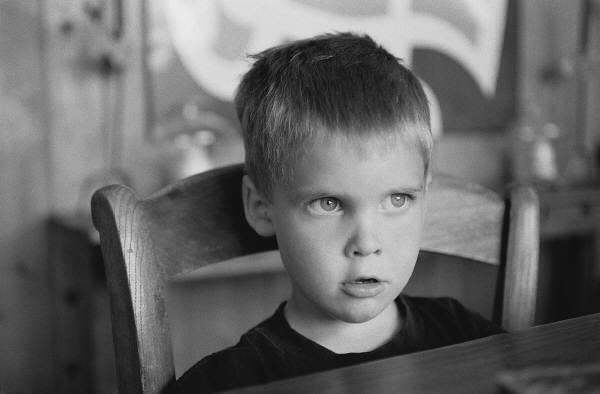 Parents raising children with attachment related issues. Participants must be referred by either their therapist or their child’s therapist prior to attending and must call to confirm attendance by the Monday before the group. The purposes of this group are to discuss unique issues that arise while parenting these children, to educate parents about attachment, and to build a supportive community for parents. Group cost is $50 for one parent or $75 for 2. Space allows for a maximum of 8 participants so please call or email Kate to ensure that there will be space available. 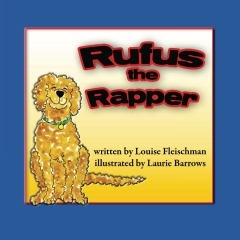 When one of my mentors, Louise Fleischman, recently wrote and published her book, Rufus the Rapper (illustrated by Laurie Barrows), I was excited to get to read and review it. I first met Louise in 2003 as a participant in a year-long externship on attachment disorders that she and other staff developed at a local adoption agency. Louise has since opened a private practice in Howard County, Anchor Counseling & Training, and we continue to collaborate professionally. I think she is among the best in the field of clinicians working with attachment disordered children and their families. Louise and I are both find storytelling to be a wonderful way to help children to acknowledge their own struggles and find a way to see a better future. Rufus the Rapper is a story about a dog that has a history of abandonment, abuse and neglect. He, like most of the children I have worked with, has little understanding of the hows and whys of all that has happened to him. Rufus learned to adapt by engaging in unpleasant behaviors designed to keep others, especially caregivers at bay. Through the gentle care of a family, Rufus finds a way to learn to connect again. This book is a great book for children of all ages (I even use books like this with teenagers) who have been through the foster care system and/or who have been adopted at an older age and their siblings- even siblings without the same experience. It is also good for any children in families that care for abused or traumatized animals and is really safe story for all children to read as a way to help children build empathy for pets and people who have had a difficult road. With a non-threatening story with a non-judgmental stance toward Rufus, the story clearly shows how it is that animals and children sometimes take on undesirable behaviors in their efforts to survive. Unlike other adoption and foster related stories, Rufus does not sugar coat the harsh reality for a dog or child who has ambivalence about being adopted, nor does it paint a pretty picture that says that once he was adopted, everything was fine. Although parents of children adopted at an older age will wish it only took three weeks (like it does for Rufus) for the undesireable behaviors to subside, children will recognize themselves in this story and reading it with a child can lead to some great conversations and give kids a means to describe some of their experiences. You can find out details for purchasing Louise’s book by clicking on the Amazon Widgets button at the top right of this page,* and you can contact Louise via email: Lfleischman1@comcast.net. 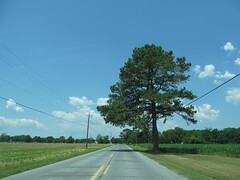 She is an excellent clinician located in Woodstock, Maryland. I am in the process of writing a book proposal. I have a question for you. What is it that you look for in a parenting book? Alternately, what would keep you from picking up a parenting book? The book I am writing would focus on low, or no-cost, parent self-care, and self-acceptance and would provide a framework for establishing a loving relationship with your child and others. I plan for it to focus on frazzled parents who feel overwhelmed by their children’s behaviors. Does this sound like a book that would interest you? I would love your input in this process. Please feel free to leave comments or send a personal email to helpforyourfamily@gmail.com and to be completely honest. I want to write a book that will be meaningful to you. 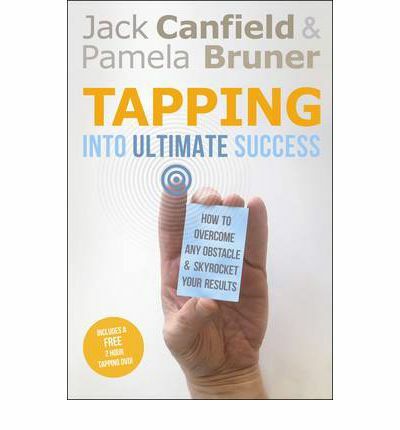 In my first collaboration with Hay House as a reviewer, I am excited to share my thoughts on a book by Jack Canfield and Pamela Bruner, Tapping Into Ultimate Success: How to Overcome Any Obstacle and Skyrocket Your Results. Because this is my first book review as part of Hay House’s “book nook” program,* I have to admit, I wanted to show you all what a serious book critic I am by finding some kind of major fault or gap in this book. While I have a few things I might have done differently, they are all minor and are more subjective really. I picked this book to review because, while I took a 3 hour course on tapping (also known as Emotional Freedom Technique) and have effectively used it in my practice and personally, I wanted to know more. What I found was that while the book focuses on tapping techniques, it actually combines three methods I use with my clients routinely, 1. EFT (Emotional Freedom Technique or tapping), 2. Internal Family Systems Work (mainly connected to inner child work), and 3. Affirmations, with tapping being the star of the show. This book is chocked full of an incredible amount of helpful, usable information that I do, in my heart, believe could be life transforming for anyone that takes the time to learn and utilize the information. The book comes with a DVD as well that is complementary to the text, and I do believe that when you are learning to tap using the methods, it is infinitely helpful to have the demonstrations on the DVD. On it, the authors selected meaningful topics to help participants work through that are fairly universal to most people and you can get help and practice by tapping right along with the video. One critique I might have is that in the book, the authors suggest that you will be able to supply your own words to describe your issues, but on the DVD, the authors have the demonstration participants repeat after them. I would have liked to see a demonstration where the participant was guided through the process of chosing their own words. If you are reading the book, I would encourage you not to be intimidated about finding just the right word choice. If you are worried about finding words, perhaps you can use that as your first fear or worry to tap about once you get started. 1. Do not expect to breeze through the book and video in a weekend. I have actually taken well over a month to read it for review. I hurried myself through it a bit because I wanted to write the review and will start back from the beginning now that I am done. I plan on working myself through about five to ten minutes worth of reading and tapping each evening as part of my self-care routine. At that pace, I will probably finish the book for the second time in about six months. I do believe that will be the pace for most people. I do not want to deter you from picking up this book however, as I do believe much of the work is amazing and with literally only a few moments, that may or may not have some mild discomfort, and using the tapping techniques described in the book, you can transform old habits and beliefs and create a new and much happier life for yourself. 2. Stick with the recommendation of the authors to keep notes about your progress. The issue I have found with tapping in my practice, and which the authors describe in the book, is that it works so well that there are a good number of people who forget the problem they came in for was actually a real problem to begin with. 3. Watch the videos and get a tapping buddy if possible to help you stick with it. A tapping buddy can also help if you worry about pin-pointing the correct words. 4. If you are having a hard time following through with tapping, or you have difficulty finding words to describe the issues you want to work through, I would suggest you seriously consider getting a therapist who is familiar with tapping. Getting a therapist to help work through these issues does not mean the book is not right for you. I believe having the book and going to therapy will shorten the time it takes you to feel better and that the therapy and the tapping will each enhance the other. I have already recommended the book as an adjunct to therapy for several of my adult clients. I know, if you have ever seen tapping, it looks so simple, and may even seem silly or, when you think about all the time it has taken for you to get through the problem you have, it can seem impossible that a little tapping on your body in specific places will change how you think and feel about issues. All I can say to that is that you need to try it and see. To help you try it, I am giving away a copy of the book. All you need to do is “like” this review on Facebook. 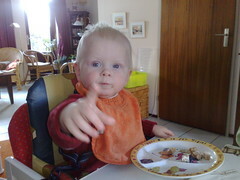 If you have not joined me on the Help 4 Your Family Facbook page, what are you waiting for?! If you do not have Facebook, you can “like” this post on WordPress. I will pick a winner at random from anyone that “likes” this post between today, 7/19/2012 and next week, 7/26/2012. To be eligible, you must live in the United States (sorry international readers). If you do not win, I have added the book to my recommended books on Amazon and you can find it easily by clicking on the recommended books link at the top right of this page. Good luck! Have you tried tapping? What was your experience? *For “Book Nook” reviews, I receive a fee copy of the book in exchange for reviewing it on my site. I give my honest opinion of each book and I do not receive any further compensation. While I like looking at other peoples crafts, I really do not like doing crafts. Whenever people ask me about crafts, I have been known to tell them that glue and I do not get along. Sometimes, however, my job or my own children call on me to be “crafty” and I need to set aside my glue issues and get down to crafting. Since this week is about being unique, I wanted to share a craft with you that my daughter actually made up herself and shared with me when she was five and that I now do with my clients. The craft is a container in which you can put reminders of happy times together, good memories, or reminders of things that make you smile. 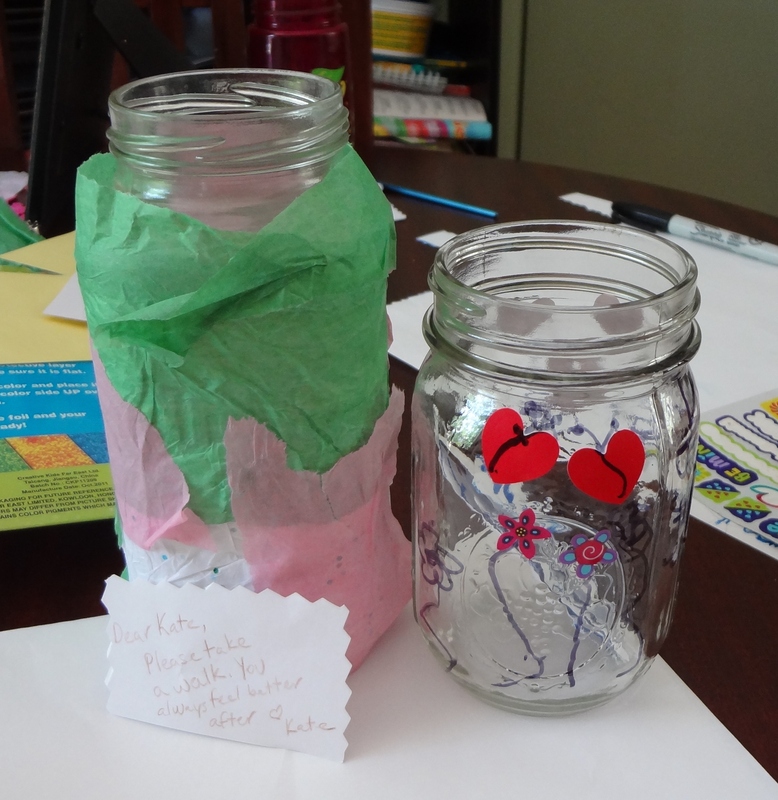 My daughter made one for her teacher that had slips of paper in it that said things like “You are beautiful” and “You are a great teacher.” I call it the rainy day jar, my daughter calls it the good feelings jar, but it can be easily adapted for many purposes. The idea is to decorate a container then put slips of paper in it with things that make you smile or personal affirmations that you have made for you. I tend to make one with my clients who are about to be adopted from foster care that they then present to their adoptive parents that contain positive thoughts about their parents or shared memories from before the adoption day. Before you start, I want to say this can be as fancy or as plain as you wish. I personally believe that each and every one of you is likely to have all the materials you need to make a nice jar in your home right now. There is no need to spend any money on this craft. Also, at some point during this activity, your child, like my child, or you, may think of some fabulous something that will make this project wonderful and unique! They may pull out something that is very special but makes the project much more difficult. Please do yourself a favor and keep it simple. 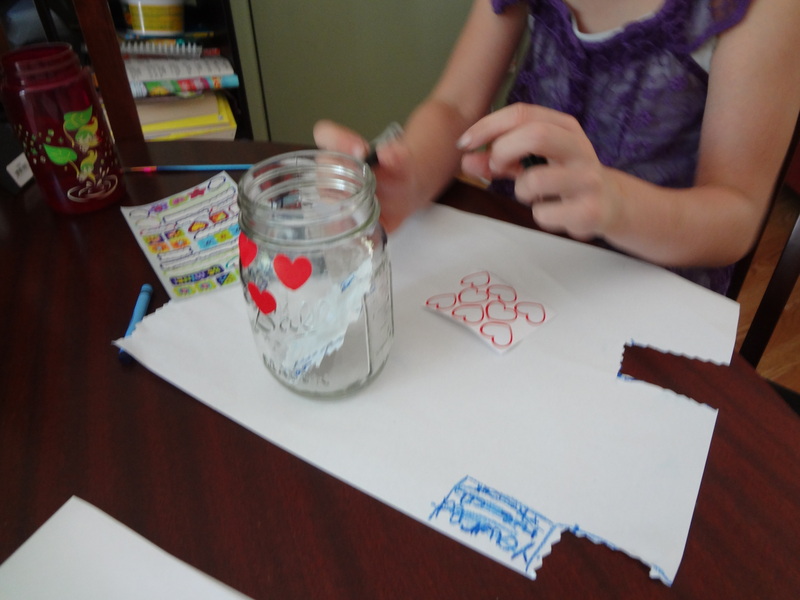 Unless you are crafty, redirect yourself or your child to get it done rather than making it a half-finished project that is going to sit on the table with all the materials out for the next week. I always would encourage you to emphasize fun and sweet over perfect. 1. Decide who your container is for. Is it for you? Is it for someone else in your family or is it a family jar? Make a vision for your container. 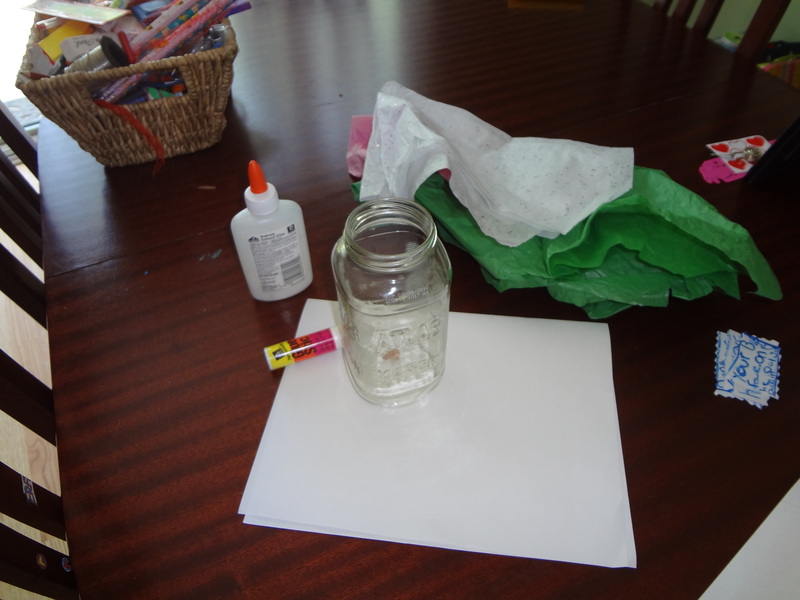 2.Decorate your container using your crafty stuff. I used tissue paper. My daughter used stickers and markers. Remember, perfect is the enemy of good. 3. Write little things that make you smile on pieces of paper. They can be memories, thoughts, affirmations or anything that makes you smile. 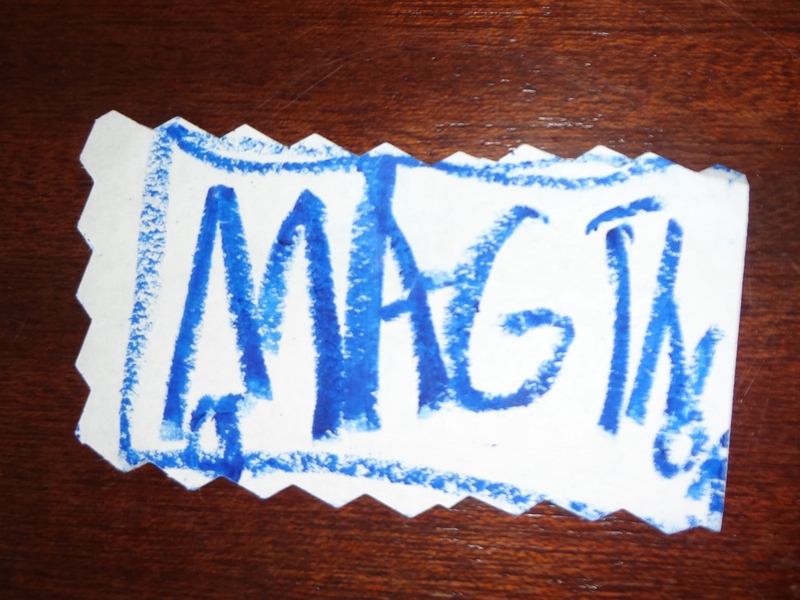 My daughter wrote the word “Megatron.” She wrote it to remind us of the time my nephew very seriously suggested to his mother that she name the baby she was going to have Megatron. No one in my family can think of that with a straight face- except my nephew who still has no idea why that is not the best name ever. Notice the misspelling of “Megatron” in the picture. Put it in the jar just like that and smile when you see the unique way your child has spelled their words. You do not have to fill the jar today. You can fill it over time whenever you think of something to put in there. I wrote myself a little note as a reminder of something that helps me feel better. 4. When you are having a parental moment in which you feel like a failure or want to calm yourself down, take a piece of paper out of the jar and look at it. * If that does not work, take another piece of paper out. Make sure to replace them when you are done. 5. Share with the rest of us. What is going in your jar? *A side note to parents with children who have a mean streak: put the jar where you have control over it so they can not use it as another thing to hurt you with by slipping a mean note in there. 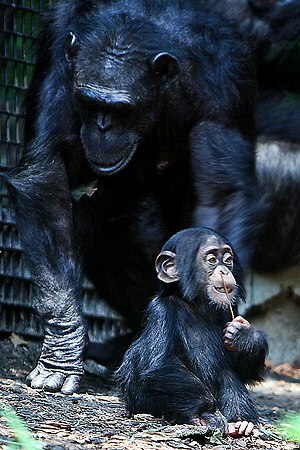 Is Chimpanzee good for your child to see if they are adopted or have lost a parent? Just from watching the commercials, we can easily see that the new Disney movie, Chimpanzee, is going to be all about adoption. While it is predictable that the movie will have warm fuzzy messages about adoption overall, if you have an adopted child, or any child who has lost a parent through divorce, abandonment, death, etc. it is a good idea to take a moment to consider whether this is a good movie for your child. Of course we know all children are different and only you can decide what is right for your child so please do not use my post as a replacement for your own judgment since obviously you know your child way better than I do. Also, spoiler alert, you will know all about the movie by the time I’m done with the post. My hope is to attempt to address the adoption related issues in the movie so you can make the best decision for you and your family and to be ready for any conversations or feelings it might bring up for your child (and you). First, let me say, the movie was pretty entertaining for the children seven and up in our group, the youngest (5) got bored half way through and I saw several younger children leave during the movie. The parents were thoroughly entertained and there were quite a few “aww’s” and chuckles throughout. The movie starts in an idealic world where little monkeys are taken care of by mommies (no mention of daddies). Little Oscar and his mom, Esha, are the focus. Children who were not taken care of by their first mommies or whose first mommies have left them in some way may have some feelings about the portrayal of moms in this part as the idea of mommies taking care of babies is presented as the only way things can go. I can see how a child who feels bad about having a mommy who did not take care of them might be triggered if they carry residual feelings of guilt or believe it was their fault their birth mother did not take care of them. Additionally, the mention of dads is not just downplayed, it is completely non-existant in this part of the movie. Soon, the idealic world of the chimps is threatened by another group of chimpanzees who want to take over their territory. Esha keeps Oscar safe during a particularly scary time when this group attacks and the movie continues to highlight Oscar’s reliance on his mother and her role in keeping him safe, fed and protected. Sadly, the other group of monkeys attacks a second time and it is during this attack that Esha and Oscar are separated and Esha disappears forever with the assumption being that only death could keep her away. It continues to be quite heartbreaking as we see Oscar get harshly rejected by several other female chimpanzees who already have children (triggering for children who have been in multiple foster care placements). During this time, Oscar tries, and fails, to find his mother. Obviously, no one is able to explain to him where she is and he is left to fend for himself. Oscar is sad and lonely and experiences difficulty finding food and caretaking. Do I need to point out the many opportunities for adopted children and/or children who have a parent that is not in their lives will have to identify strongly with this section of the movie? After suffering for an intense ten minutes or more during the movie, Oscar begins to follow the alpha male, Freddy. He begins gently befriending Freddy (there is a good conversation to be had about shadowing adults and learning from thier modeling behaviors here). Freddy, who it was earlier emphasized in the movie, had no interest in the younger chimps, slowly also begins turning toward Oscar and teaching him to get food. Over time, their friendship grows and, in a particularly heartwarming scene, Freddy grooms Oscar and lets him ride on his back. During this portion of the movie, there is no mention of moms and, knowing that I see children with attachment disorder in my practice who work pretty hard to come between their parents and who often punish the mom and complian to the dad (because moms are scary for them since they represent the original abandoning mom), I can see this particular part of the movie reinforcing that behavior a bit. Additonally, I can see how children who have struggled to bond with an adoptive parent would be triggered to wonder what it is about them that caused them to be first rejected or abandoned by other parents if that is their emotional experience. Those children who struggled to bond with an adoptive parent may also wonder why it is so easy for Oscar (no internal loyalty struggle here, also no negative behaviors from Oscar) to bond with Freddy and just what must be wrong with them that they have difficulty bonding. While Freddy and Oscar are bonding, however, trouble lurks nearby, the narrator, Tim Allen, says that while Freddy and Oscar have been building their relationship, Freddy has neglected to protect his area and the other chimpazee group is closing in for another attack. Freddy senses this and begins to do some team building again. Oscar feels ignored by his new dad and we see him again feeling lonely because he does not understand why Freddy is turning away from him to take care of other chimps. This made me think about moms or dads taking care of new babies or other siblings and the triggers that has for many of my adopted children, not to mention kids in step-parent families. I can see this movie being especially nice for single and/or adoptive dads as it reinforces that dads always protect their children even if they didn’t always know how to parent at first. 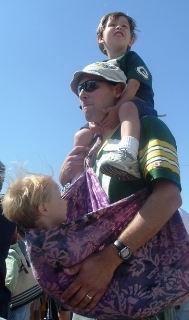 I can also see it being an issue for moms and other primary, nurturing caregivers (including dads) who, like I said before, have a child that uses them as a representation of all abandoning people in their lives, and for children who did not have a mother that took good enough care of them before entering an adoptive family. I would also recommend it for children who are able to articulate their feelings about adoption, parental loss, etc. over children who are still unable, or unwilling to discuss those issues. Ultimately, it is up to parents to decide what is right for their children. Either way, in the end, the movie has a happy ending where Freddy and Oscar get to be together and Freddy focuses on Oscar again. I see multiple opportunities for parents to bring up good conversations for kids about: whether Esha’s disapperance was Oscar’s fault; how Oscar must have felt when the other mom’s rejected him; how Oscar befriended Freddy and whether they loved each other right away; how dads and other parents protect children even though sometimes it is hard to see how (like when they go to work or pay attention to other kids); and why Oscar had an easier time of bonding with Freddy (because his first mom was good at teaching him how to love other chimps). Have you taken your child to see this movie? What did you think? Did I miss anything? I would love to hear how the experience was for your child. Quite a few recent books have alluded to just how fed up parents are with people expecting them to be the perfect parent. Scary Mommy, by Jill Smokler, was just released this week and details confessions of real parents who feel all the feelings that go along with parenting that we often do not talk about such as, anger, isolation, depression, fear, and embarrassment. In this age where so much of what we do is recorded and we see so many recorded images of parents on reality television, it also seems like everyone is judging everyone else’s performance all the time. When we do this, we can wind up in a seemingly endless cycle of judging others and ourselves constantly without any relief in sight. In fact, there are several studies that have come out in the past few years stating that parents are significantly less happy than non-parents. I believe part of this is our unrealistic, perfectionistic tendencies during which the thought patterns can begin to get quite vicious. My profession has not been much help in making parents feel much better either, I’m sorry to say. Not only do most of our books focus on what you can do for your children, rather than how to help you feel better so that you can be a better parent, we are constantly telling you how to improve communication with your child, have educationally enriching activities, spend quality time with your children and encouraging you to take constant care of their emotional needs. While all that stuff is nice and worthwhile in many ways, I think too much of it also takes away the important quality of being genuine with our children, you know, like the genuine feelings expressed in the popular picture book for adults “Go the F@$k to Sleep,” by Adam Mansbach. If you don’t know that book, take a moment to look it up on youtube and you can listen to Lawrence Fishburne read it to you- when your kids are not in the room. Really, isn’t that how most of us feel when our children are coming down six and seven times to say goodnight and asking to be tucked in even though we already tucked them in? Here is what I think many parents are wanting and it is something we hear all the time about everything but being perfect parents… everything in moderation! Yes, even lovey, touchy stuff. It’s actually good for the kids to understand that their parents feel- gasp!- genuine emotions. If you are fakey, fakey all the time and pretend things are nice, they know it’s BS anyway and later they call you on it- I’ve seen it too many times to have any doubt about this. And you know, many times when our kids call us on stuff they are right. Has your child ever said anything to you like my daughter when she said, “Mom, that’s what you say when you’re not really listening?” She was right. I had no idea what she just said. That’s the daughter my husband and I joke that someone must have told her in the end she will get paid per spoken word because she sure does act like it. You bet I zone out the chatter sometimes and maybe even miss important things. As one of my favorite professors in my Master’s program said, one of the great thing about people is that if you miss something important they said the first time around, they are pretty certain to repeat it. I know this is true for my daughter too. Now, don’t get me wrong, remember- everything in moderation, so it is also important to take time to turn on our listening ears for our children every day, but I also want to be realistic that it feels quite impossible to be in the moment and listening to one child while the other is asking you to make them a peanut butter sandwich. Another reason genuine = good with our children is that they, like us, are humans too! They are often not perfect and they need a good example of how to recover from imperfection. I give my kids lots of opportunities to witness imperfection without even trying that hard. I’m a real natural 🙂 I burn things, forget stuff, and plan poorly sometimes. Most parents do. It’s the ones that admit it and give children an example of how to recover via apology, forgiveness of self and others, humor, etc. that have happy, not entitled (another by-product of over-perfect parenting), healthy children with a good sense of who they are and who their parents are. Dare to be perfectly imperfect! Your kids will thank you for it.